Preheat oven to 400°F. In a large bowl, place all of the meatball ingredients and mix well (if you don't mind getting your hands dirty, I find it best to mix meatball ingredients with your hands). 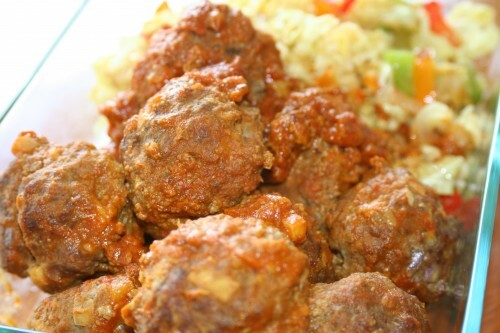 Form into golf-ball sized meatballs and place in a glass baking dish. Bake for 25 minutes. Makes 8-10 meatballs. In a large skillet saute the garlic in the coconut oil over medium heat for 2-3 minutes. Add the honey, curry powder, and tomato paste and whisk together. Add the chicken broth and continue to whisk until the sauce is smooth. Bring to a simmer. After the meatballs come out of the oven, add them to the sauce and turn to coat well. Cover and cook for an additional 5-10 minutes. these sound delicious. i love curry! I've been on a real meatball kick lately so this just naturally made my five to try list for the week. Have a wonderful weekend! Oh my, that looks so yummy and I love curry! I made baked meatballs the other night for dinner! I did a post on it, please check it out and let me know what you think! I’m new to this blogging thing and I love checking out foodie blogs! oatmeal because that is what I had on hand. I will definitely make this again. Thank you for the yummy recipe. Tina, I'm so glad you enjoyed this meal!